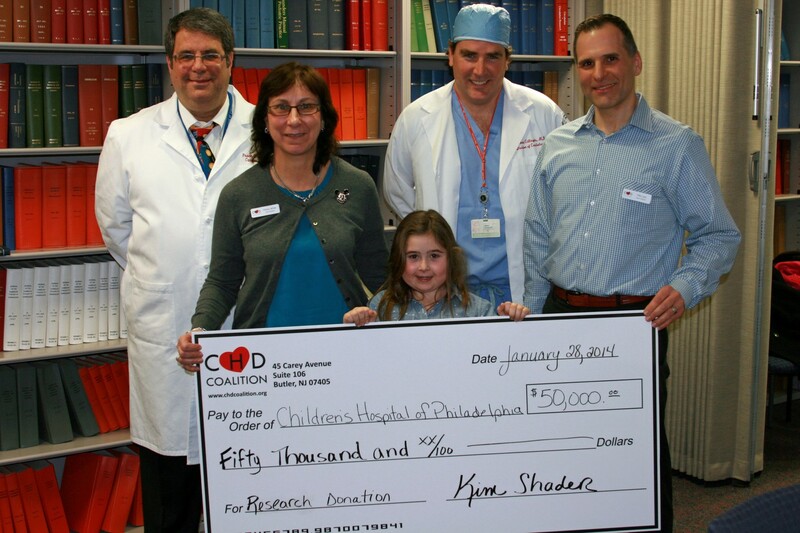 BUTLER, NJ, JANUARY 2014 – The Congenital Heart Defect Coalition (CHD Coalition) donated $50,000 to the Children’s Hospital of Philadelphia (CHOP) for crucial stem cell research, focusing on the reduction of fatal heart failure in CHD survivors. The results of the “Cell Based Rescue of Ventricular Failure in Congenital Heart Disease” research promise to have an enormous impact on the long-term quality of life for children and young adults born with a heart defect. The CHD Coalition also donated $5,000 to the Cohen Children’s Medical Center of New York for research in the use of Speckle Tracking Imaging technology to replace the use of traditional cardiac MRI for children and young adults. A complete CMRI study often requires children to undergo anesthesia and the use of specialized equipment. While avoiding anesthesia-related risks, STI holds the potential to be more widely and more frequently used for children, which will aid in the early detection and intervention of heart defects. The CHD Coalition’s ability to make these donations was a direct result of the hugely successful 6th Annual CHD Awareness Walk held last September in Ridgewood, NJ. With nearly 950 attendees, the event raised over $100,000. In addition to funding critical research programs, proceeds are used to offer scholarships to CHD Survivors, and to provide ongoing support to families affected by congenital heart defects.